Note: This article has been amended after complaints from the 'Friends of Bishop Seán Manchester'. We apologise for any misrepresentation. Dusty vaults, ivy-strewn pathways, desecrated coffins and shadowy goings-on. Sounds like something from a Hammer film doesn’t it? 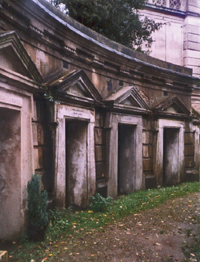 However, the hi-jinx of Highgate Cemetery reached just such a gothic climax during the 1960s and early ‘70s when it was alleged that a tall, dark, red-eyed spectre prowled the foggy catacombs of London’s neglected burial ground. From 1967, several witnesses described being attacked, physically and mentally, by a seven-feet tall malevolent shape near the North Gate of the Western Cemetery, on Swains Lane. The spectre was linked to dead foxes discovered in the cemetery, and reportedly drank the blood of several local women. Trespassers to the dank dwelling were left clutching their throats after attacks by an unseen assailant. Suicides, skeletal bodies dumped in vehicles, black magic rituals and the alleged rising of the undead contributed to the murky hue associated with the cemetery. At the time, even the most bizarre reports were considered credible – the Ham & High newspaper was full of the ‘vampire’ craze and other London papers jumped on the bandwagon. Indeed, it is surprising that the Highgate ‘vampire’ does not rival London’s other mysterious figures – Jack The Ripper and Spring-Heeled Jack – in the popular imagination. The hysteria surrounding the phenomenon has all but vanished since the 1970s, when thousands would flock to the cemetery for nightly vigils in search of the undead. The two leading investigators into the case became focal points. Seán Manchester and David Farrant have been embroiled in claims, counter-claims and court cases over the years. Their differing interpretations can be examined through their websites and books. After the troubles of the 1970s, the cemetery is now 'guarded’ by the Friends Of Highgate Cemetery who allow access only by guided tour. Whatever the truth behind the Highgate abomination, many believe something did lurk in that musty place. It is a cemetery that conjures visions and shadows, and still causes locals to fear, knowing that perhaps the darkness may return one day.